Good morning! I hope you had a wonderful weekend. I have a super simple thank you to show you today. The other day I needed some really quick thank you cards and several of them. I had about 20 minutes before I had to run and pick up the kids so whipped up 6 of these really quickly. I used a layout similar to one of my stamp club cards for this month. I had everything already out so used the same supplies, just switched up the card size - these are 3x3 and the punch sizes. The Spice Cake dsp - have I told you how much I LOVE this dsp? - was punched using the 3/4" circle punch and the vanilla was done using the 1" punch. These were so quick to whip up and they are a great way to use up those little scraps of dsp. 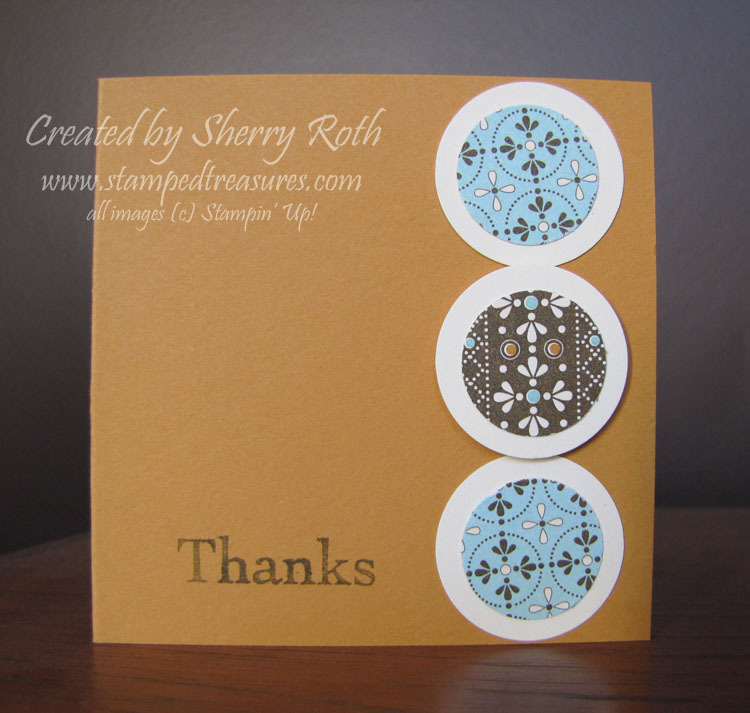 You could use the same idea on a full size card just change the circle sizes! Sorry for the quick post - I've got to prep and set up for a team event tonight. The Treasure Stampers who qualified for the Christmas Keepsake Box Kit are getting together to make it together. I'm so excited to make this project, it looks beautiful, I can't wait to see it for real.